This Oct. 27, 2017, file photo shows then-Director of Communications for the White House Public Liaison Office Omarosa Manigault at the White House. 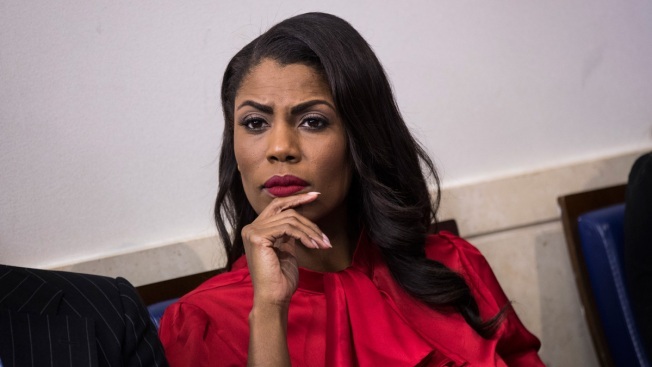 Omarosa Manigault Newman, the former "Apprentice" contestant who became a White House aide, claims in her new book that President Donald Trump is a "racist" who used the N-word, NBC News reported. In her upcoming tell-all book entitled "Unhinged," to be published next week and obtained by NBC News directly from the publisher, Manigault Newman alleges that Trump was caught on a microphone saying the N-word "multiple times" during the filming of "The Apprentice," and says there is a tape to prove her allegation. Manigault Newman wrote that she did not hear Trump use the slur, nor has she listened to the alleged tape. She cites three sources as having told her of the existence of the tape and what Trump says on it. The Guardian first reported Friday on the quotes in the book and said it had obtained a copy. White House press secretary Sarah Huckabee Sanders said the "book is riddled with lies and false accusations."